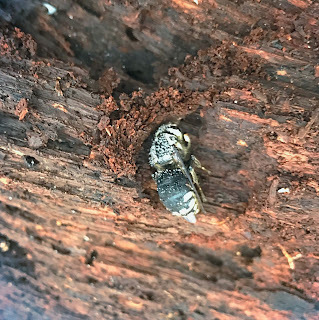 I found two Bald-faced Hornets (Dolichovespula maculata) under a piece of rotting wood earlier this week. Only new queens hibernate, the rest of the colony dies when temperatures drop below freezing. These queen have already mated and will start new colonies next spring. Assuming they survive the winter, which doesn't at all seem guaranteed given the scant protection afforded to them by their shelter. Cold is the most obvious danger. I didn't find anything that specifically referred to hibernating Bald-faced Hornets, but insects as a group have a wide variety of behavioral and biochemical strategies for preventing and/ or controlling ice formation in their bodies. 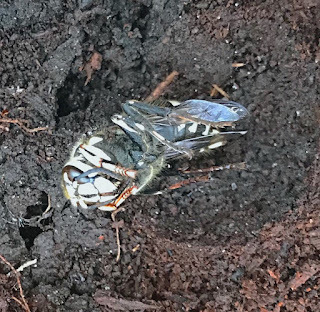 But many of these strategies partially rely on an insulating blanket of snow; which helps moderate the temperature of the hibernating insect's immediate surroundings; our Minnesota winters seem to be trending towards a less consistent snow cover. Bald-faced Hornets have a bad reputation for being nasty insects that sting with little provocation. I believe this is largely an exaggeration. I've often watched them up close as they chew on the wood of an old bench, raw material for their paper nests. Of course coming into contact with their large, ovoid paper nests can result in many, many painful stings. But often their nests are high up in trees. I'm sometimes asked something along the lines "What are they good for?" The quick answer is they prey on other insects, some of which are pests. But I think the best answer is why do they have to be "good" for anything; they are living creatures in their own right and that should be enough.